Attention fans of Buffy the Vampire Slayer! With perfect tone and lots of amazing references to both the TV show and the movie, Slayer is an excellent addition to the Buffyverse. Pure fun written with love by an incredible author. 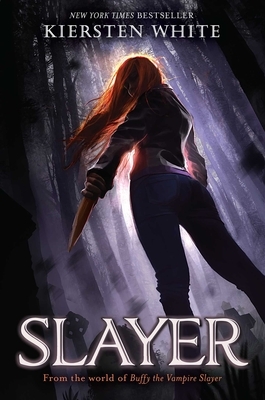 In this thrilling fantasy set in the world of Buffy the Vampire Slayer, Nina’s entire life takes a turn when she discovers that she is a Slayer, destined to fight demons. As she’s suddenly thrust into the spotlight—somewhere she’d never thought she’d be with her twin sister Artemis, who’s always taken the lead—her relationships are tested, secrets are uncovered and a mystery unravels. This book has achingly realistic characters that will leave you frustrated and satisfied, hating and loving them from chapter to chapter. The plot keeps you on the edge of your seat, and you’ll find yourself rooting for Nina as she makes questionable choices that will decide the fate of those around her and the world. And the best part is, you don’t have to watch Buffy the Vampire Slayer to read this book!